The Tuareg (Kel Tamasheq) are an ancient nomadic people who have inhabited the Sahara, one of the most extreme environments in the world, for millennia. In what ways have the lives of the Tuareg changed, and what roles do they have, in a modern and increasingly globalized world? Here, leading scholars explore the many facets of contemporary Tuareg existence: from transnational identity to international politics, from economy to social structure, from music to beauty, from mobility to slavery. migrants traversing the desert to reach Europe. Tuareg (Kel Tamasheq) between Niger, Algeria and Libya. 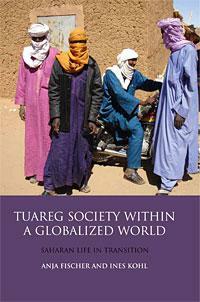 transnational movements, this is essential reading for students and scholars of the history, culture and society of the Tuareg, of nomadic peoples, and of North Africa more widely. "This new book develops the theme of how globalization has reached out to such societies and further incorporated them into wordwide networks of production and consumption. The second related theme is to look at such societies through the lens of nomadism or mobility, not of pastoralism." in: Nomadic Peoples, Volume 15, Issue 2, 2011: S. 141-143. PART I: WHERE IS SAHARAN ANTHROPOLOGY GOING?